Tony Noonan Racing :: VARENNA MISS WINS AGAIN! It was a huge thrill to win the final event on Caulfield Cup day with the lightly raced but very talented filly VARENNA MISS (Redoute's Choice/Mica's Pride). Having only her third race start she was able to take the giant step up in class to take victory in the 1100m Carlton Draught Plate. She was lucky to get a run, the heavy track meant plenty of scratchings and she was able to get a run as fourth emergency and number 20! It is not often that a jockey gets off after winning a race at Caulfield on a big day and says 'she didn't handle the track, she was not comfortable at all' but this is what Steven King said but when they win this is all forgiven! She only won by a nose but that was enough. The stable were thrilled but so too were the punters who had had backed her into favorite at $2.20. We were thrilled for the owners Glenn and Kerry Fraser who have been exceptionally patient with the her and hopefully they will now be able to reap the benefits. Tony Noonan is very excited with way lay ahead with this talented filly 'she is a very good filly. Today she was not happy on the track but still managed to win - a sign of a very good horse'. 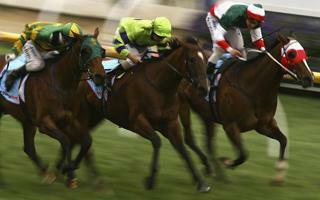 We look forward to her next start which maybe at Flemington over the Melbourne Cup carnival. We were also delighted with our runner at Pinjarra yesterday MILITARY KISS who had her first start in WA after racing with some success here in Melbourne last season. She has gone over there and unfortunately sustained a virus but has shaken that and was just narrowly beaten in her first start in Perth which gives us great hope with her over the next couple of months. We are looking forward to Moonee Valley this Saturday where unfortunately we do not have a runner in the Cox Plate but we do have BELSCENICA in the Tesio Stakes and we are sure she will go well there. After that we have Flemington the following week where we hope to have a number of runners and of course, the After-Derby Barbie is on Sunday, October 31st.